If you ever watched livestreams of any eSports event, you might have noticed that the camera sometimes stays too long on one person in the crowd, and it can get really uncomfortable. Or it could be so terrifying and shocking that you flee immediately, like the ladies above. This funny incident happened during the third match between rOrO and Shine on Proleague. Here's the full video, with the commentators' reaction around the 10:40 mark. 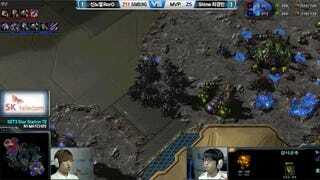 Come on, there's no shame in watching StarCraft II live!